In continuing the mission of enlightening business owners–aspiring and seasoned–on the best ways to present, plan, and seek investors for your business, BlackEnterprise.com solicited Fund Manager and Founder of Impact America Fund, Kesha Cash, to get her professional take on who she considers a worthy investment, who would likely be turned down as an investment and why. BlackEnteprise.com: As an investor, what are you generally looking for in a startup? Cash: IAF invests in individuals that have developed high-growth, practical technology solutions that improve the health, education, and income-generating opportunity in economically disadvantaged communities. When we analyze our pipeline of investment opportunities, the entrepreneurs we get most excited about have spent considerable time testing their ideas and gaining a deep understanding of their industry to identify a focused starting point to capture a large market opportunity. What would be a red flag that would traditionally prohibit you from funding a startup? Possible mission drift, where a business might exploit a vulnerable population, is at the top of the review list when we are making our investment decisions and engaging with portfolio companies. IAF’s approach is new, and we hope to get more right than we get wrong. We have passed on investing in companies with great traction and notable investors because we determined the business model was at risk of possible future mission drift or exploitation (not necessarily intentional). When is an entrepreneur ready to seek out funding from an investor of your caliber? We want to see real metrics that support the large market opportunity story as well as proof that you and your team are the right people with the skills and team chemistry to accelerate the momentum and move the train forward at full speed. Spend time developing “traction.â€ Gain a sizeable percentage of total market share or create a new market–this will demonstrate the viability of your business model. Traction metrics will vary by business type and includes measurements like: number of people signing up as a user on your platform; number of active users; number of paying customers, repeat customers and customers in your pipeline; number of people impacted by the product or service; number of customers you have access to via strategic partnerships and your network; and consistent month-over-month customer and revenue growth. We are impressed by founders who understand what sources of capital are needed for different aspects of their business operations. Different sizes and types of businesses are attractive to different types of investors. It is important to know what type of capital (equity, debt, lines of credit, and/or grants, to name the common ones) is appropriate for your business. Venture capital is not appropriate for all business types or all aspects of business operations, and it is important to explore other sources of capital that may be more appropriate and less dilutive to equity holders. 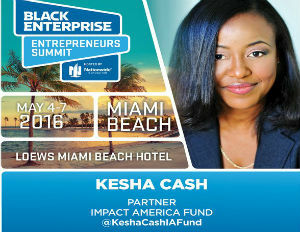 Learn more from Kesha Cash and other financiers who are changing the face of investing at the 2016 Black Enterprise Entrepreneurs Summit, May 4—7, Loews Hotel Miami, Miami, Florida.Â Register now. For more information, visit www.impactamericafund.com and follow KeshaCash on Twitter @KeshCashIAFund, @IA_Fund.